Manicuring nails has become an increasingly popular routine. As we are all busier and busier, it is often a very affordable luxury to stop off at the neighborhood nail salon and in 20 minutes come out a little merrier and feeling a little more spiffed. Although stereotypically utilized by women, we now see some younger pre-teens and occasional men having outside nail services. So what can go wrong? Infections, Psuedomonas, cellulitus, fungal nail infections, ringworm, warts, nail loss, bacterial nail infections, and abscess just to name a few. Diabetics, people on cancer medications, and patients with poor or decreased lower leg circulation have a higher risk of poor would healing and increased infections. If the person who sat in that nail salon’s fancy spa throne chair with the massage before you had athlete’s foot, you have a reasonable chance of picking that up. While some salons are up to date with antiseptic procedures, the majority are not. Many salons fake antiseptic procedures by having a jar of blue antiseptic on their counter but never putting any instruments in the fluid or if they do not for any adequate amount of time. We recommend purchasing a quality set of nail files, cuticle pushback, nail clipper, and buffer. A ultra-rick long lasting moisturizer for dry, cracked hands and feet, frequently washed hands, dry brittle nails and cuticles, and dry skin associated with psoriasis. 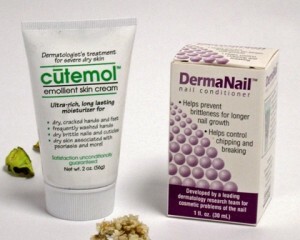 Helps prevent brittleness for longer nail growth and helps control chipping and breaking.